I grew up with Arnold Schwarzenegger's 1987 classic, Predator. It's definitely one of the best Sci-Fi action flicks out there with memorable lines like "Aint got time to bleed." Of course I rolled my eyes after hearing producer, Alex Rodriguez and director Nimród Antal were rebooting the series. But, being such a huge fan of the original, it's almost like I had to see Predators regardless. The audience is introduced to the cast as they drop from the sky into a remote jungle after being plucked from their former lives. And of course they are armed with gigantic laser scope rifles, Samurai swords and knives of all sizes. They seem to have nothing in common with one another, other than they are trained to kill. The badass motley crew includes a couple of special ops. soldiers, a convict, a gang member and a Mexican drug cartel enforcer. The odd man out is a nerdy doctor named Edwin (Topher Grace), but he has his uses as the film progresses. Soon it becomes clear they’ve been dumped on a giant game preserve for the hunting sport of the trophy-collecting Predators. We quickly learn as much as we need to about all the characters to want most of them to make it out of there alive - needless to say most of them don’t. The filmmakers do have a few surprises in store… things I never saw coming, which was pretty cool. Laurence Fishburne makes a very brief appearance as a half-mad, long-time survivor. He provides enough background information on the enemy for them to formulate an escape plan. 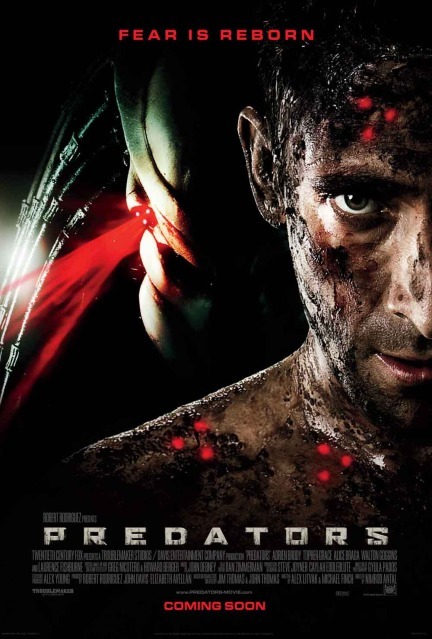 Royce (Adrian Brody) devises a strategy that results in a hand-to-hand combat between the classic Preda tor and the new, streamlined version Predator. Of course Brody ends up shirtless during this combat, which is definitely not a bad thing. Predators isn’t perfect: The characters sometimes state the obvious as they’re catching up with what the audience already knows, and the physics of the planet is at times confusing (at first Royce notes that the sun isn’t moving at all — their first clue they’re not in Kansas anymore — but later it’s nighttime). But the characters, action and humor are enjoyable enough to brush aside these trivialities. I thought it was pretty alright - not great but certainly not horrible. I was definitely entertained. The only question I had was, who put them on this planet and why were they chosen? I'm sure they'll answer those questions in the sequel though. Adrien Brody looks pretty good in that pic though. I'd give that an A+.